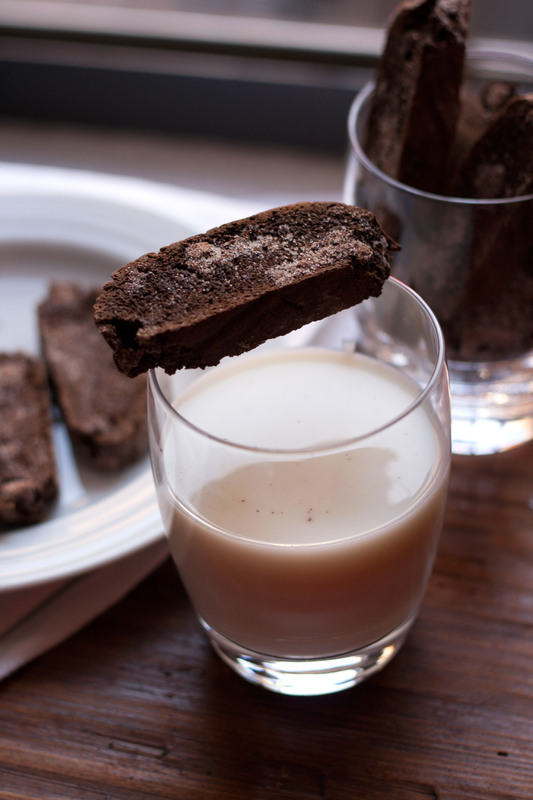 This recipe eschews butter for a very traditional biscotti. Far from crumbly, they truly crisp on their second bake, yet aren’t teeth-shattering. They are rich and deep in cocoa flavor, studded with chocolate chunks, and, yes, laced with heat. A good helping of cinnamon and a smidge of cayenne in the dough give just enough to be different and certainly leave a little tingle on your tongue. I tossed them in cinnamon sugar, too, giving them just another layer of intrigue. 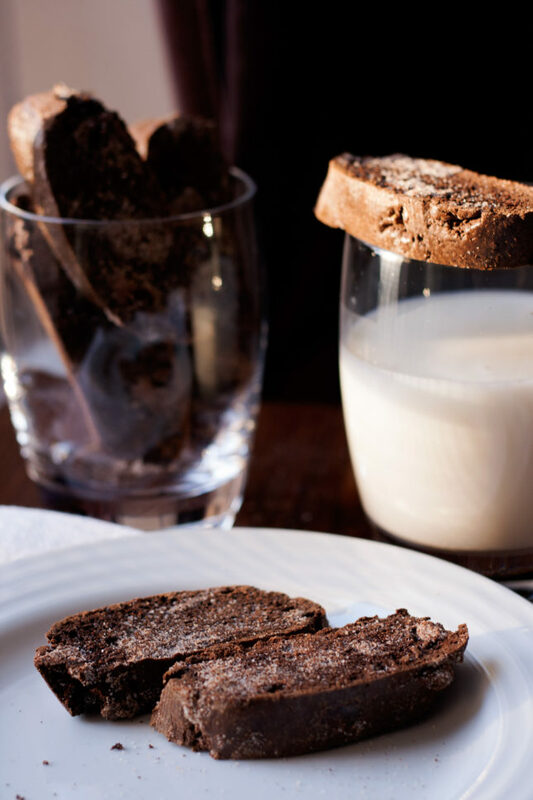 They are truly lovely with a cup of creamy coffee but I’ve been enjoying them, kid-style, with a glass of cold milk. I love the way they soften ever so slightly with a long dip in that pool of white. 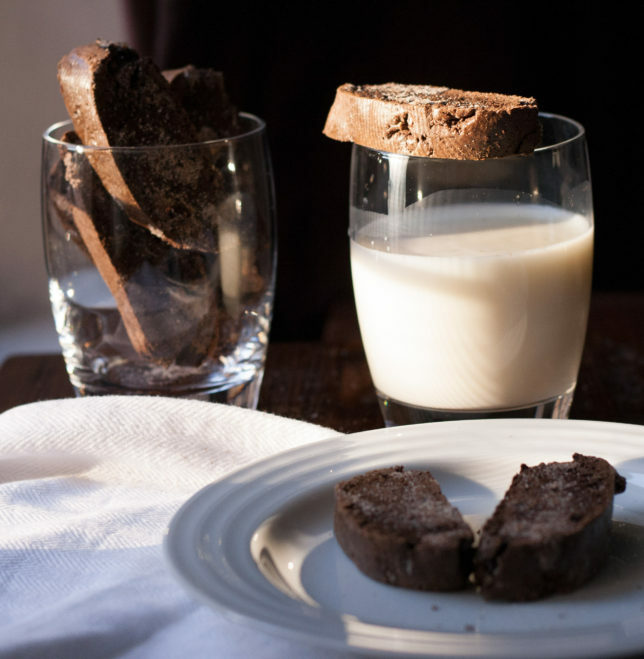 The milk tempers the heat ever so slightly, yet somehow also enunciates it, along with the dark, sweet chocolate. It’s the perfect trifecta. 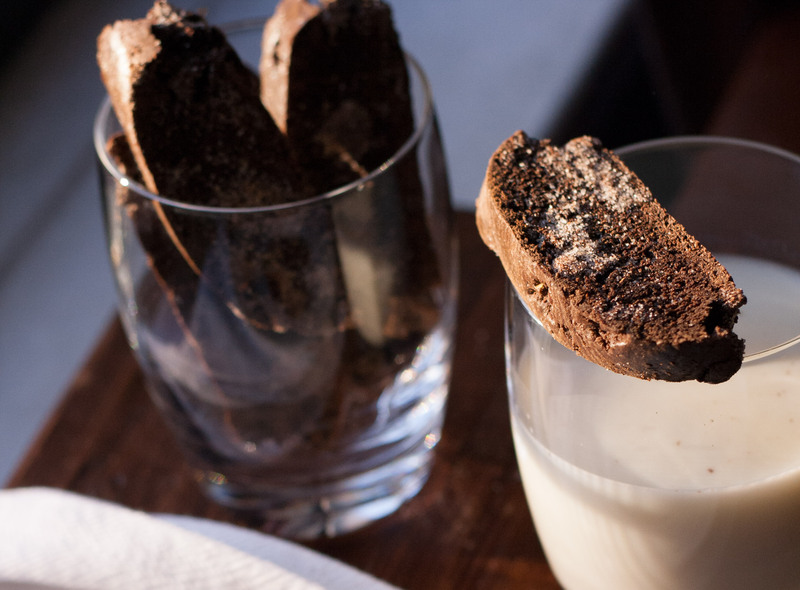 So if you know someone who was a little bit naughty, but a lot of nice, share these Mexican Hot Chocolate Biscotti with them. They might swoon and tell you these little cookies changed their lives. Preheat oven to 350 degrees and line a baking sheet with parchment or a silicone mat. In a medium bowl, sift together the flour cocoa powder, baking soda, salt, cinnamon, and cayenne pepper. You can whisk these, too, if you don’t have a sieve or sifter, but make sure to get all the lumps of the cocoa out. In a large bowl, beat together the eggs, sugar, and vanilla extract. Gradually stir in the flour mixture, then mix in the chocolate chips until the dough holds together. Divide the dough in half, and on a lightly floured counter, roll each half into two logs about 2 ½ to 3 inches in diameter. Transfer to prepared baking sheet, placing them side by side with enough space for them to grow, and gently flatten them with your hands. Beat the egg white until loose and a little frothy and brush the tops of each log. Bake for 25 minutes, until firm to the touch. Remove from the oven and let cool 15 minutes, then transfer to a cutting board. 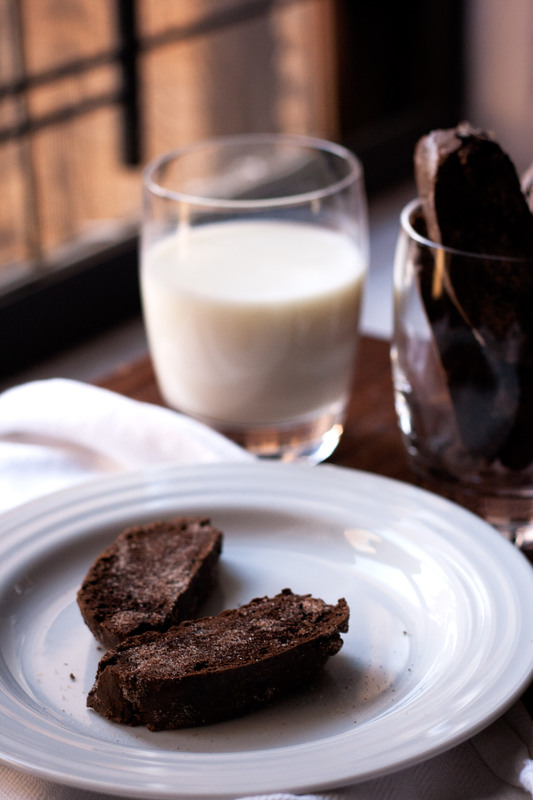 Using a serrated knife, gently cut the biscotti on the diagonal into ½-inch slices. Combine the sugar and cinnamon in a shallow bowl and dip each side in the mixture. Place each biscotti cut side down on the baking sheet and bake again for 20-30 minutes, until the cookies feel mostly firm. 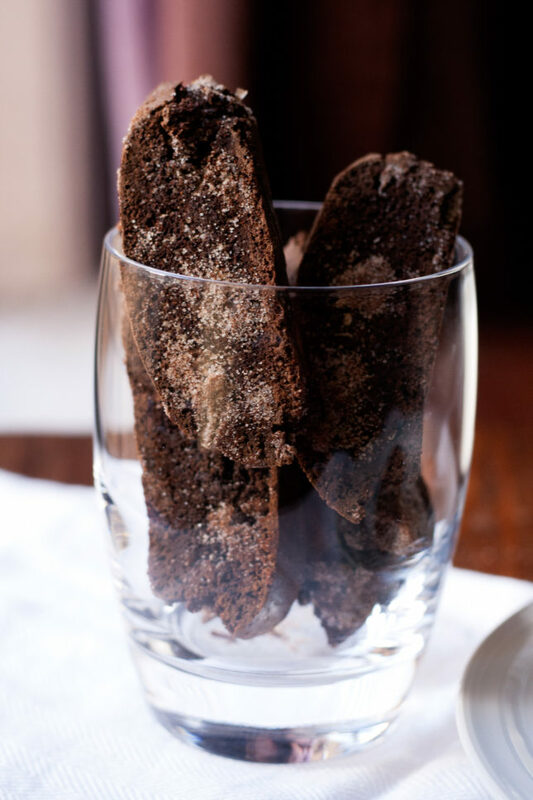 Cool the cookies completely, then store in an airtight container for up to two weeks, if they last that long.